Take a glance around the oceans, rivers and lakes of today and you'll confront an astonishing diversity of fish, from narrow-bodied eels to the 25-foot-long giant oarfish to delicate, fluttering seahorses. The vast majority of fish alive today — approximately 96 percent — are known as teleosts, a group of ray-finned fish that emerged 260 million years ago. Evolutionary biologists and paleontologists since Darwin have offered hypotheses to explain why teleosts seem to have "out-evolved" other groups. The closely related holosteans, for example, once dominated the oceans but are now considered "living fossils," representing just eight species in forms that resemble those of the past. But this view of the teleost success story may be based on the false premise that teleosts dominate today because they have always been more evolutionarily innovative than other groups. A new analysis of more than a thousand fossil fishes from nearly 500 species led by the University of Pennsylvania's John Clarke revealed that the teleosts' success story is not as straightforward as once believed. Examining the first 160 million years of teleost and holostean evolution, from the Permian to the early Cretaceous periods, the scientists show that holosteans were as evolutionarily innovative as teleosts, and perhaps even more so. "A lot of these so-called living fossils that appear to be kind of boring today actually have a pretty rich history," said Clarke. "If we were to go back in time to the Triassic and you had to place a bet on which group was going to do better going forward, you would have definitely chosen the holosteans. It just didn't work out that way." It's easy to see why scientists have long presumed teleosts exceptional. They represent 29,000 diverse species worldwide, roughly half of modern vertebrates. In contrast, the eight living species that comprise holosteans share a resemblance, and all dwell in the freshwaters of eastern North America. 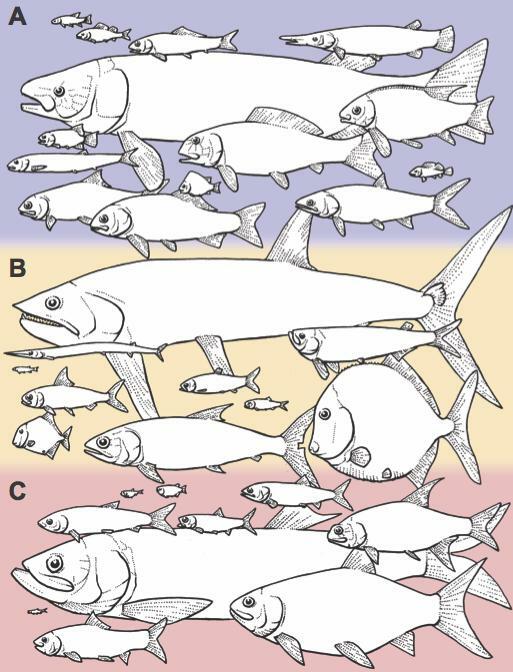 Numerous ideas have been put forward to explain teleost success, including the flexible structure of their jaws, a diversity of reproductive strategies and the symmetry of their tail fins. "There were times in the past when holosteans were top dog," Clarke said. "There are lots of holostean fossils, and they were quite diverse, not only in numbers but in the wide variety of sizes and shapes they possessed." To do so, they relied on a dataset that included the size and shape of hundreds of fossils Clarke had compiled during visits to 15 museums as part of his Ph.D. research. They also constructed "supertrees," to summarize the relationships of nearly all known extinct species of holosteans and teleosts from the Triassic, Jurassic and Early Cretaceous. These large trees were built from more than 100 smaller trees already available in the paleontology literature, from studies that examined the morphological traits of fishes to work out their evolutionary tree. In their various analyses of the specimens, Clarke and colleagues found no support for the expectation that teleosts would change their body sizes and shapes faster, or be better able to "invent" new sizes and shapes compared with holosteans. On the contrary, using timescales from molecular studies that suggested holosteans and teleosts evolved much earlier in Earth's history than when their first fossils appear, holosteans seemed to come out on top, appearing more innovative at evolving new sizes and faster at evolving between different shapes. "There is no compelling evidence on any timescale that teleosts were the best at evolving different body sizes and shapes," said Clarke. "And in fact, if anything, there is some evidence hinting that maybe holosteans were more innovative when it came to evolving different body sizes and faster at changing shape." The researchers also used the dataset to investigate whether genome duplication correlated with an increase in evolution rate and innovation. They found no consistent link with size evolution but did see indications that shape evolution was elevated in the more geologically recent teleosts with duplicate genomes relative to more ancient groups of teleosts. However, this occurred because those more ancient teleosts were particularly slow at evolving shapes since they compare equally poorly with holosteans, rather than signifying any exceptional evolution in those teleosts with duplicate genomes. On this basis, the authors deem the role of genome duplication on size and shape evolution to be "ambiguous," suggesting that, in agreement with recent studies of diversification in living teleosts, genome duplication is not the magic bullet that explains the diversity of all teleosts. "Many biologists have focused upon trying to explain why some groups are so incredibly successful," he said. "But there hasn't been a lot of focus on the other end of the spectrum: how do you get living fossils, these species-poor, long-lived groups that stick around doing the same thing for millions of years." The study was supported by a Palaeontological Association Whittington Award, a Natural Environmental Research Council Cohort grant, an Australian Research Council grant, the Philip Leverhulme Prize and the John Fell Fund.